WJ Tennent (father), Essex Street, Masterton, NZ. Canterbury Infantry Regiment, 3rd Battalion. On Memorial wall, Timaru; Timaru Boys High School War Memorial (Library) as K W Tennant? 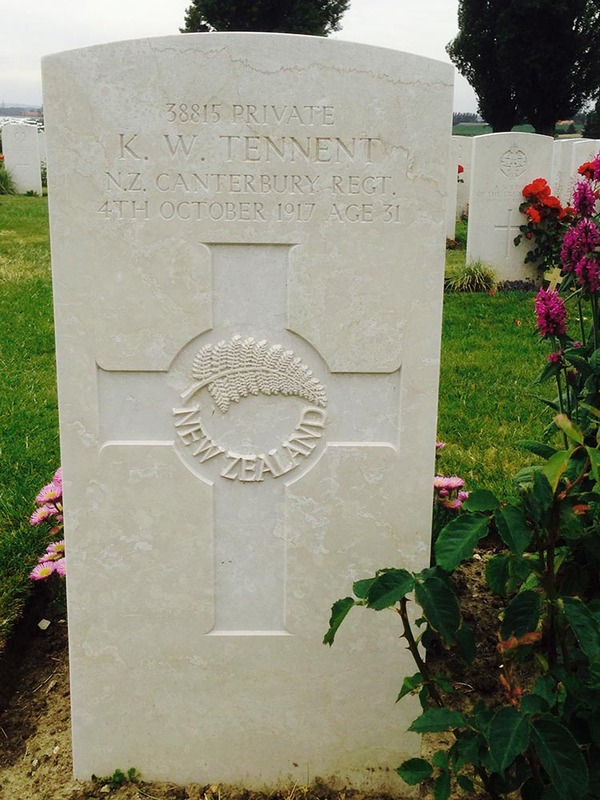 Kenard Tennent was the son of William James and Katherine Jessie Tennent, of 69 Essex St., Masterton, Wairarapa, NZ. Kenard attended school at Kingsdown and Waitohi Schools before moving on to Timaru Boys High School. Before enlisting in the war he farmed at "Bowlands" in the Wairarapa, at "Rawhiti", and on his own property at Rissington. Kenard was killed at Passchendaele on 4 October 1917, and was buried at Tyne Cot Cemetery near Ypres.